VEDI, exclusive partner of the Aeroplan® loyalty program in the optical category, announces the availability of this program to all independent eyecare practices across Canada. Founded in 2012 by industry veterans, VEDI has proved after a successful year that loyalty programs deliver. First year results for the program saw purchases of $12.9 million by Aeroplan members from participating practices; 30,146 Aeroplan members purchased from participating practices, with an average increase spend by Aeroplan patients of 64.6 per cent vs. the practices’ average. “The program attracted 2,845 new patients to the participating practices. Optical suppliers, including J&J, Nikon, and Zeiss participated in the program with bonus Miles offered for their products. These promotions proved to be highly successful,” says VEDI President Syl Ghirardi. The Aeroplan loyalty program is the elite loyalty program in Canada with approximately five million members. Loyalty programs offer practices the opportunity to differentiate with one of the most recognizable brands and allow them to compete in an increasing competitive landscape. The patient loyalty program costs less than one per cent of the practice’s sales while increasing profits. VEDI will be offering new programs this year, such as Redemption of Miles for product. Starting in April, VEDI will launch the redemption program, allowing Aeroplan members to redeem their Miles for optical products at the practices. 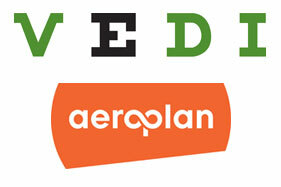 Aeroplan is a registered trademark of Aimia Canada Inc.